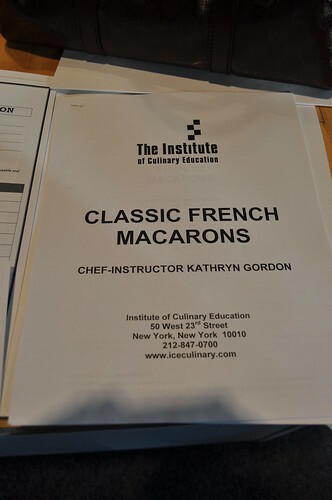 As a Valentine's Day gift to Marcus and as a Christmas gift to Erin, I signed the three of us up for a Classic French Macaron baking class at the Institute of Culinary Education (aka ICE) over at the Flatiron District. How did I hear of this class, you ask? Well my dear friend Linda, my culinary soul sister, told me about it while back. We got around to discussing how much we love macarons when she mentioned that she and her husband had taken an intense macaron-making class at ICE and how she learned to appreciate the hard labor behind those tiny French pastries that cost about $2-4 a pop. I had been scouting out for availabilities on the website since last August until I was able to find something for April when ICE opened its Spring semester registration in early December. When I had checked back in August, all the macaron classes listed were either sold out or were themed macaron classes (e.g., holiday macarons, savory macarons, etc. ), and while the latter would've been really interesting, I wanted my first macaron baking experience to be for the classic kind. That being said, I promised myself I would hold out until I saw the class reappear again, and low and behold, it did! We arrived about 15 minutes before the scheduled time of 6 PM (did I forget to mention this class is four hours long?!) and received our welcome packet filled with instructions for the class. The class (and all of the macaron classes over at ICE) is run by pastry chef-instructor, Kathryn Gordon, co-author of the upcoming cookbook, Les Petits Macarons: Colorful French Confections to Make at Home. She studied at L’Académie de Cuisine in Maryland and has worked/staged in the renowned pastry kitchens of Rainbow Room, Tavern on the Green, Le Cirque, Le Bernardin, and Osteria del Circo. She used to compete a lot in many pasty competitions, now seldom competing, but she still provides commentary for bread and pastry championships for the Food Network. Before she committed to her calling in the pastry arts, she had a career on Wall Street, which I find really fascinating, as I wonder if I could ever be that bold and move away the bean-counting party of my life. But alas, that is another thought for another day. Anyways, we began class with 18-20 or so students sitting around a prep table in one of the kitchen classrooms, where Chef Gordon debriefed us with a brief introduction about French macarons, the ingredients they require (almond flour, egg whites, powdered sugar, and meringue), and the three general techniques to make the cookie part of the macaron (French/ordinary/common/cold, Italian, and Swiss). She referred to French macarons as the "world's moodiest cookie" as well as the "controversial cookie" in the world of Meilleurs Ouvrier de France (aka MOFs, a title of Best Pastry Chef of France). 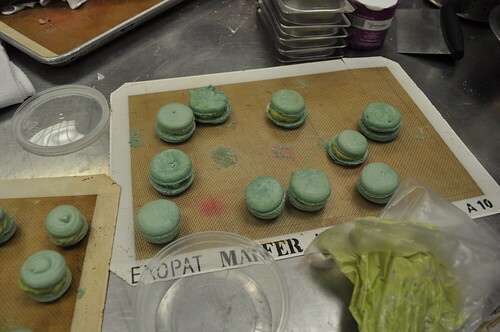 During class that day, she taught us the Italian method to make meringue for these macarons. It is the strongest of the three methods I mentioned previously and is the same technique used to make buttercream and nougat candy. Chef Gordon told us she finds Italian-based meringues don't spread as much (due to the use of sugar syrup and the way it "cooks" the egg whites as they are beaten by the mixer). The Italian method also has the highest "shine" because the sugar is fully melted into the batter (per the recipe's instructions). Prior to attending this class, Erin and I had attempted to make French macarons from scratch, and let me tell you how messy, frustrating, and time consuming it got, even when we followed the wise words from Martha Stewart herself. They looked ugly, deflated, and grotesque, and we couldn't figure out why. When Chef Gordon asked if any of us had any experience making French macarons during the debrief, everyone who had reported unfavorable results. All of Chef Gordon's explanations for the problems our classmates ran into were explanations for all the things that went wrong with our macarons. 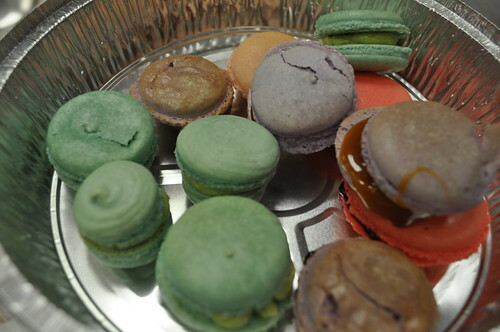 Basically, everything that could go wrong with macarons went wrong with ours! After the debrief, she paired us up (me with Marcus; Erin with Lauren, another girl from class that day) and sent us to our work stations, stocked with standard KitchenAid mixers, digital scales, a food processor, and any basic kitchen tools we needed. I found it interesting how the outlet plugs hung above the work stations as having electrical wiring along the sides of the kitchen would be much of a safety hazard. Very pragmatic! Because the recipe is quite long and complex, I won't be able to sum it up here, but I'll give you the highlights of what went on during our four-hour macaron-baking intensive class. Marcus and I got to a late start because one of the members of our class stole our digital scale (those scoundrels! ), and we were having trouble with cooking the sugar syrup to the exact temperature required (as it is the key ingredient to the Italian-based meringue). Luckily, Chef Gordon was super helpful and very resourceful (undoubtedly with her past experience in professional pastry kitchens) when we ran into any trouble or had any questions. She understood this mysterious French pastry from its complex core to its delicate exterior--once she saw the problem we were having, she knew exactly how to remedy it (or would just tell us to start over because it was too late to repair). 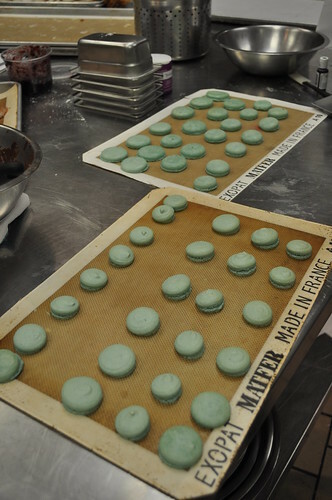 After redoing our meringue, we were able to pipe the macaron cookies onto Silpat, a silicone non-stick baking mat. 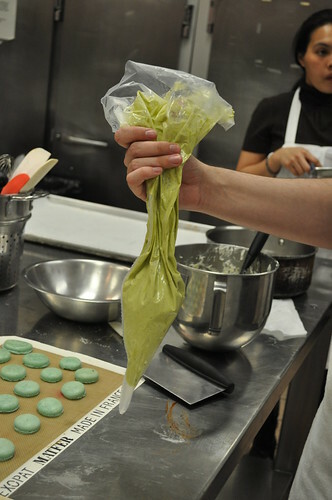 A similar thing happened when we were making the pistachio buttercream, what we chose for the fillings of our macarons (which required cooking light corn syrup in the same fashion as the sugar syrup--to a particular temperature, without actually having a thermometer). 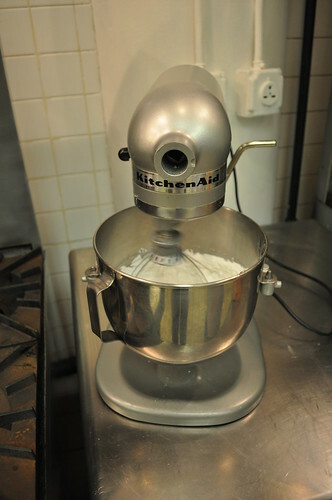 Our friend, Mr. Chrome KitchenAid Mixer, whipping our egg whites for the pistachio buttercream filling. We mixed in butter, heated light corn syrup, and pistachio paste later on in the process. 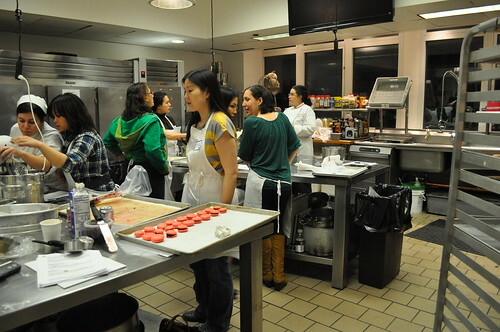 The rest of the class finishing piping their macarons, while Marcus and I were finishing up our filling. Once we finished our buttercream, our cookies were finally ready! Notice our macarons are slightly tinted green (Marcus's idea) so it could appropriately match our pistachio-flavored filling. Also, it made ours stand out because the rest of the class did white, red, or purple. Erin piping her purple macarons with cappuccino ganache. I thought taking a photograph from the side would be interesting--love how it turned out! 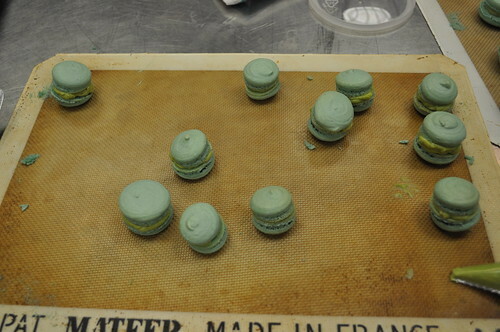 The rest of our post-piped macarons. I snuck a bite of one of our macarons--it was definitely comparable to pistachio macarons I've had before! Gathering the rest of the class's macarons to take home, which includes Fleur de Sel caramel macarons, blueberry jam macarons, cappuccino macarons, and of course, pistachio macarons. I have to say that I liked our green ones best, but then again, pistachio always seems to win me over! 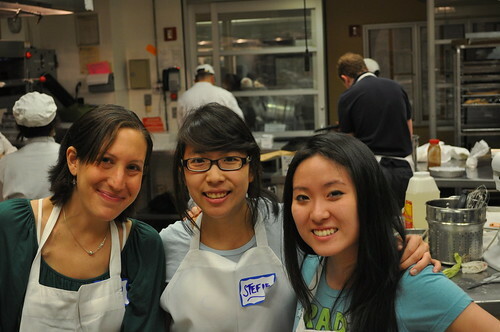 Erin's baking partner, Lauren, with me and Erin in the trenches of French macaron baking. Findings: I found this class really informative about all that is involved with baking French macarons--from the theory behind macaron-making to the numerous approaches to make them at home. 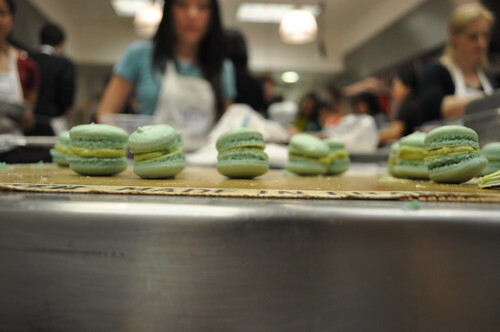 The class helped hone our piping skills, overall baking knowledge, and macaron recipe repertoire. 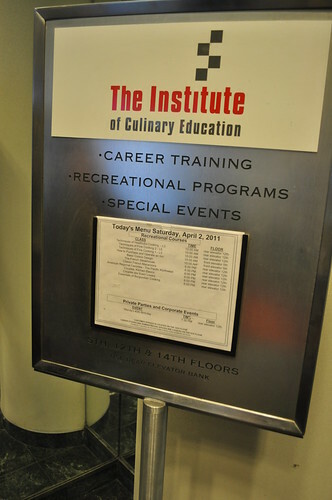 It was quite an intense four-hour class--lots of information was packed in that period of time, so it was a tad bit overwhelming, especially for individuals that may not have been familiar with general baking knowledge and/or skills beforehand. I would love to go back for a themed-macaron baking class now that I have a better understanding of how the overall baking process works, so I could be more efficient and learn more about other flavors and fillings! I highly recommend this class for anyone who has had some exposure to basic baking (even if it's Duncan Hines straight-out-of-the-box)--it's definitely not a class for beginners. It is a bit more advanced than that, and since the recipe is basically thrown at you after the debrief meeting, you have to be fast on your feet and act quickly so you don't fall behind! Chef Gordon was very knowledgeable, and her experience and expertise with these little French goodies is very extensive. She has this ability to identify what's wrong just by looking at it, so trust that you'll be in good hands with this class. 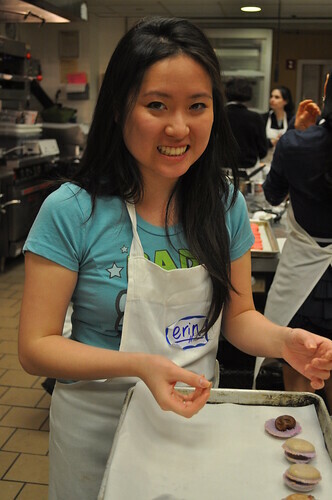 At $110 per person, you get four hours of instructions with hands-on baking with experienced chef-instructor Kathryn Gordon as a resource (along with two assistant pastry chefs), and the macarons you make to share in class and take home. Like me, you'll definitely leave the class with a deeper appreciation for this complicated cookie (plus, you can finally understand why bakeries and cafés charge the premium that they do for these French delights). Thanks again to Linda for recommending this class to us! 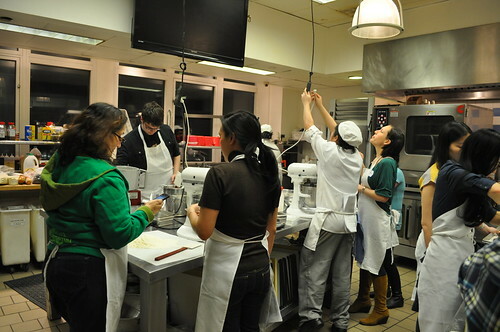 Price point: $110 per person for a four-hour baking class. Your macarons are BEAUTIFUL! I love the color scheme. Two things - be sure to see Marie Antoinette, if you haven't already done so. Aside from the fact that I love Sophia Coppola's films, the cinematography/macaron love is strong. Second, as discussed, please don't forget to go to Boulangerie Bay Bread on Pine Street in SF http://laboulangebakery.com/ - the first macarons I ever had and probably second only to Laduree. Lovely sandwiches and pastries for a picnic around SF, too. Thanks, Linda :) will have to check out Marie Antoinette and other Sophia Coppola films and look out for those macarons! And no worries--Boulangerie Bay Bread is on our list. I made sure to put it first thing after you told me! Will need to consult you for what to do in SF before we leave!